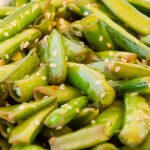 The sesame sugar snap peas recipe is a result of my looking for something new to do with the sugar snap peas I found on sale. We bought a giant bag at our local bulk item store. While we typically eat them raw, I decided to take a different route since we had so many. My children love Asian food and sesame chicken, so I got inspired and broke out the wok. A speedy recipe bursting with flavor, which entices more veggie consumption. Wash, dry, and trim the ends of the sugar snap peas. Heat the sesame oil in a wok at medium heat until very hot. Add the sugar snap peas to the heated oil and fry for five minutes or until tender but still crisp. Add the garlic, sesame seeds, and soy sauce to the oil and peas and fry for an additional 3-5 minutes.